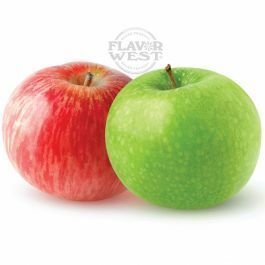 As the name Implies, Double Apple flavor is a blend mix of Green Apple & Red Apple sweet flavoring. This flavor offers sweet and tart taste of fresh fruity. Enjoy a unique flavor that never disappoints. Type: Double Apple water soluble flavoring. Ingredients: Natural and Artificial Flavoring and Propylene Glycol. USP Kosher Grade Flavoring. Usage Rate:15-20% for E-use. Flavor Suitability: Drinks and beverages, desserts, pastries, candies, lip balm and more. Specific Gravity: .99 No Refunds on Flavoring. fresh crisp with just enough tart. can be mixed alone for all day vape.